3.1 What Type of Exhibit is Right for Your Brand? Your trade show booth is a tool that supports your trade show marketing goals, so making sure your goals are properly outlined is a key step in designing your trade show booth. Make sure you clearly communicate your trade show goals to your exhibit design partner so they can create an exhibit around your objectives that will help you reach your objectives. During the consultation phase of the trade show booth design process, prioritize which design features are most important for you to achieve your goals. 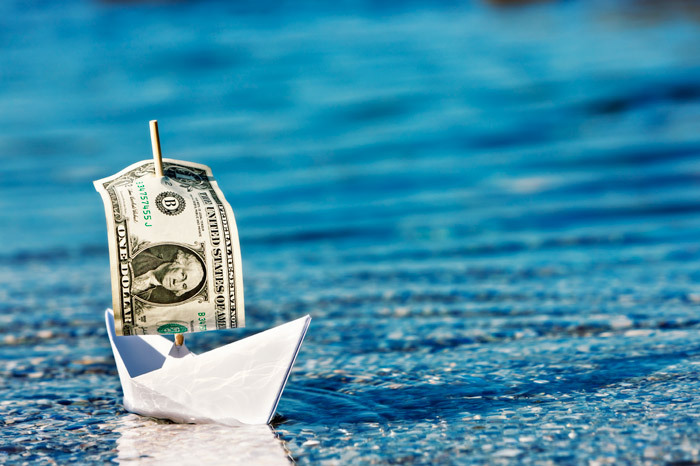 Cross off features that are more expensive and less essential to your overall exhibiting objectives to keep costs down. To determine the overall lifetime cost and potential return on investment of your exhibit, estimate how many years and at how many shows you per year it will be used. 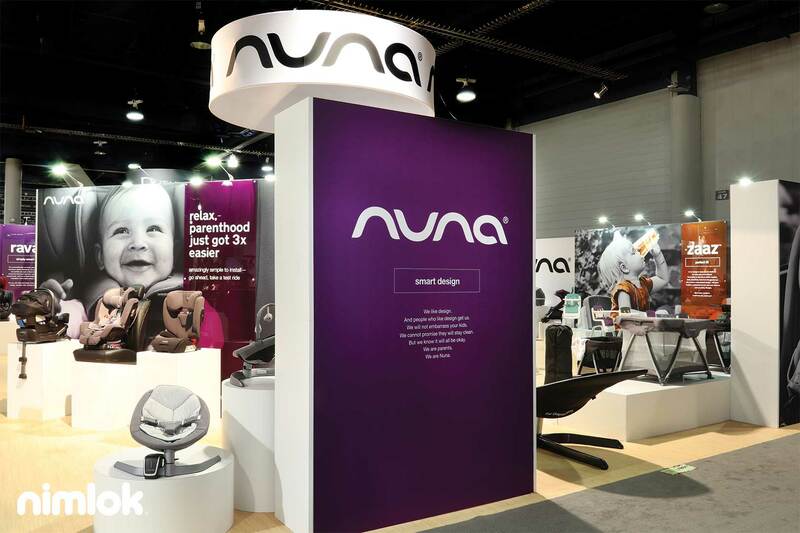 The average lifespan of trade show display hardware is five years. For graphics, the average lifetime is one year. For more tips and a step-by-step worksheet, download our free trade show budget template! Before you head into your first meeting with your exhibit partner, research design components that are best suited for your goals. Search online for custom trade show booth designs for inspiration and make a list of the key components you want to include in your booth. Knowing what specific design elements you want included in your booth will be useful when communicating with an exhibit designer. What Type of Exhibit is Right for Your Brand? Effective use of booth space can reduce wait times for attendees. Potential clients are less likely to linger and want to speak to show staff if it’s difficult for them to maneuver and they find themselves jockeying for space with other attendees. 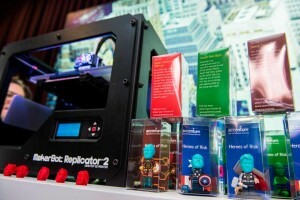 Educating the public on a brand is one of the primary reasons for exhibiting at a trade show. Therefore, an attendee should never leave an exhibit space without getting a thorough understanding of the brand they just visited. A trade show booth can help facilitate the storytelling aspect of exhibiting. The design of a trade show booth can reflect the history and the motivations of a brand visually, without a booth staffer ever having to say a word. Thoughtful reflection on the company culture, vision and commitment to their community and customer are all essential in letting the public know who they are and what they stand for. Smartly-planned exhibit graphics can help drive home this messaging to attendees. The use of visual media is also an incredible narrative tool that every exhibitor should keep in mind. Review how your product is made, is process unique or interesting? Give your audience something that matters to them. Connect with them by understanding their needs. Think about their journey and issues they may have. A well-told story is equal parts engaging and educational. Stories are a great way to prompt consumer action without seeming too pushy, and designing your booth with your story in mind will assist with this goal. 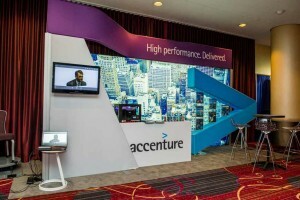 Graphics are arguably the most important element of a trade show booth design. High-impact graphics are the key differentiator between capturing the attention of attendees and drawing a high volume of booth traffic versus having your booth relegated to being just another exhibit on the crowded show floor. While your coloring scheme should be consistent with your overall marketing design, it should also be bright enough to stand out. Colors that are too drab or neutral tend to cause your exhibit fade into the background. If your color dynamic doesn’t include brighter colors, consider incorporating metallic surfaces or interesting textures instead. Make sure your color choices convey the emotions you want to create in your visitors. Attracting prospects is vital to creating a strong return on investment, so it is important to create a high-level of visual appeal within a trade show exhibit. A smartly-lit home can accentuate design features and minimize trouble-areas. The same can be said for a trade show exhibit that utilizes lighting in creative and unique ways. Dimly lit displays are a common mistake often seen at most trade shows. A well-lit display is essential, allowing visitors to easily view the important details of your graphics. Additionally, lighting can be used to brighten other key areas of your exhibit, such as product displays and promotional materials. 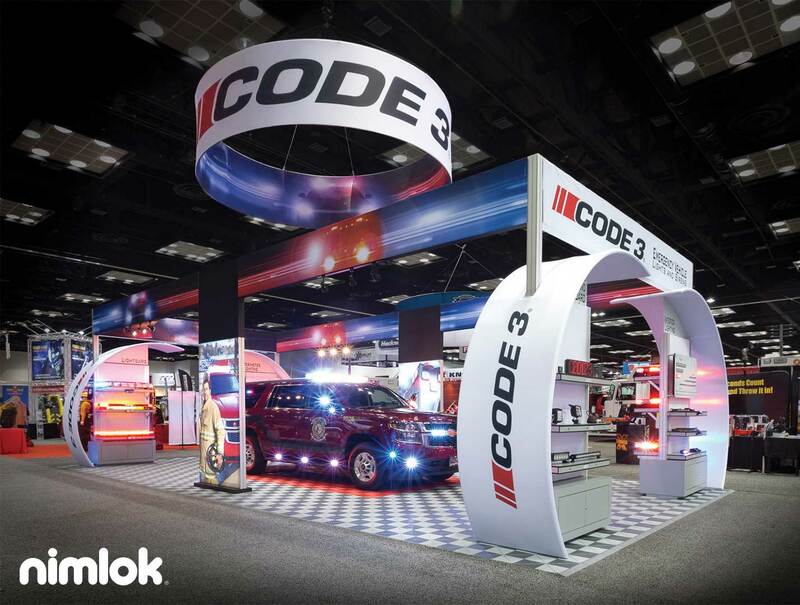 Check out our post on trade show graphics to learn more about the options and considerations around designing goal and brand-focus graphics. Flooring is one of the most important pieces of a great trade show booth design and often gets overlooked. Trade show flooring can create an inviting appearance for your booth and it can also provide comfort for your staff and visitors while standing for extended periods of time. Event flooring or carpeting can be boring, and at worst it may clash with certain colors or design elements of your booth. Custom flooring can enhance these design elements, as well as the overall experience for attendees visiting your booth. Incorporating multimedia as visual or auditory elements can enhance the overall experience for attendees visiting your booth. From the visuals attendees see to the music they hear, multimedia plays a major role in setting the atmosphere and communicating messages that help exhibitors achieve their goals. Multimedia can be used to support product demonstrations and contests and enhance booth graphics via monitors, touch-screens, video walls and augmented reality. Decide early what types of technology you wish to incorporate into your booth so they can be a considered in the trade show booth design process from the beginning. Don’t underestimate how useful storage can be during an event! Storage spaces help to reduce in-booth clutter, especially for items brought by your booth staff. Valuable items, such as tablets, can be locked in storage areas when not in use. 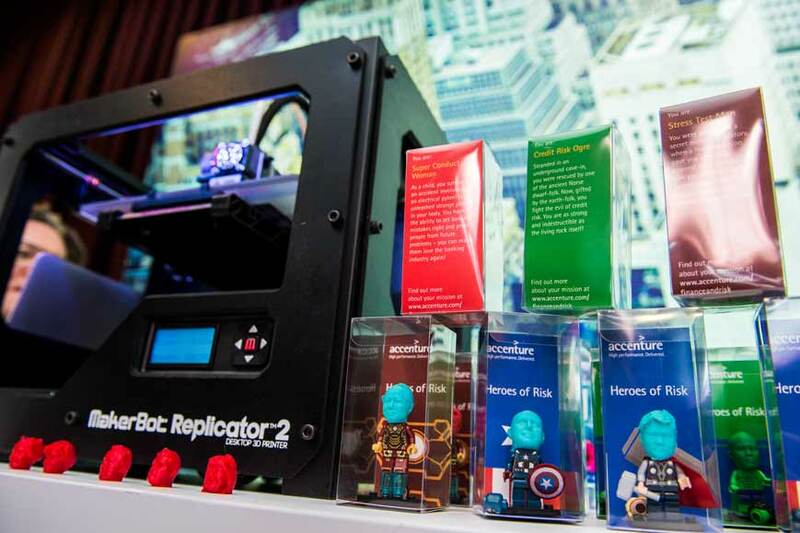 Storage can be especially important for brands doing giveaways or handing out informational collateral to attendees. There are a number of in-booth storage solutions available to exhibitors, such as shelving and lockable counters. Selecting the right exhibit partner is crucial to designing a successful trade show exhibit. Below we outline the keys to selecting an exhibit partner that can meet your company’s exhibiting needs. The process of finding the right exhibit partner can take time, and it can take months design and build on an exhibit. Begin your exhibit partner search early so as to find the right fit while leaving enough time to design and build your trade show exhibit. When speaking with a potential exhibit partner, be upfront with your needs, budget and deadline. Research each potential partner’s capabilities to ensure that the companies you are considering can meet your desired budget, timeframe and trade show booth design requirements. Experience is everything when it comes to selecting the right exhibit partner. Exhibit partners with a long and successful history have experienced teams of exhibit designers and builders who work as a cohesive unit, minimizing miscommunication and leading to an overall easier design and building process. Ask for and follow up with references from each potential exhibit partner. Contacting references allows you to learn more about the experiences others have had with the services you require, how closely an exhibit partner can follow budget, direction, how they resolve issues and the level of customer service they provide. Complete a needs assessment form. The needs assessment form is a list of questions your exhibit partner uses to better understand your creative vision. This information will help guide your exhibit partner regarding what materials and design techniques to use when designing and building your exhibit. The exhibit designer will provide you with rough sketches and concepts of an exhibit design. Once you agree to a design, the exhibit designer will then create line drawings and 3D renderings of your exhibit to give you a better understanding of how your exhibit will look once completed. 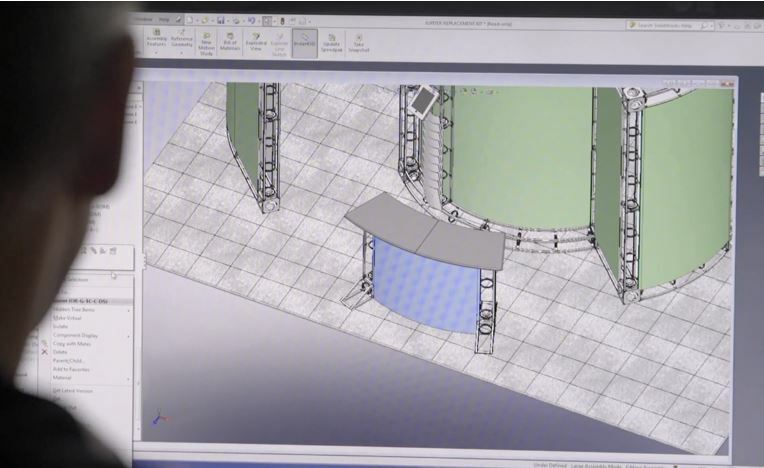 The exhibit designer will then turn over the design to exhibit detailers who use CAD software to outline the building blocks of your exhibit’s framework. The exhibit detailer provides project managers and exhibit builders with complete specification of parts, materials, finishes, and construction methods to work from. Then graphic specification are finalized and converted into templates for graphic designers. After your exhibit is built, you will have the opportunity to preview the booth at your exhibit partner’s facility. During the preview you can ask your exhibit partner to make tweaks and adjustments to your booth if needed. Once you sign off on your exhibit, your exhibit partner will pack up and the exhibit to your event. Creating a killer trade show booth design requires careful planning and skillful execution. If you want more exhibit design tips and ideas for your next exhibit, download Nimlok’s Exhibit Design E-book. Learn how to complete an exhibit design needs assessment, design your trade show graphics and more with this free comprehensive guide. Eric- well done. I really like these tips. This is a really cool inside look into the design process. I’ve always wondered what technologies are used – it would be interesting to hear which software Nimlok uses. Trade shows are an amazing thing and I just love the whole process of attending them. I like how your designers actually provide sketches of what it is that we are looking for. I’ve never seen it done that like. For now, I like to use https://boothdesignideas.com. It helps me find trade show booth design ideas before I go to an exhibit house to design it for me. it is very informative post thank you so much for sharing with us. All the tips are very good. I like how you said to make sure you clearly communicate your trade show goals to your exhibit design partner so they can create an exhibit around your objectives that will help you reach your objectives. I am designing an exhibit for a trade show. Thanks for the tips on trade show booth design.